Marvel's Iron Man has finally gotten the anime treatment, and to be quite honest I was a little disappointed with the result. Not because of the anime treatment, because he looks pretty slick as an anime character and the battles were exciting, but the story was a bit of a let down for me. It often felt more like a monster of the episode rather than a cohesive and engaging story, and several elements in the story just didn't feel natural. So what happens is that Tony Stark heads to Japan to build an Arc Reactor which will give Japan unlimited free energy. Yet, in general the Japanese people seem to not like him very much. Watching the extra features on the disc, they explain that it is meant to be a clash of cultures, which is a fantastic idea, but it wasn't implemented in such a way that made sense to me. The other part of the story is that Tony is retiring from being Iron Man, and is mass-producing Iron Man armors called Iron Man Dio. Now this really doesn't seem right. He's going to trust all the power of Iron Man to many, many people? I really find that hard to swallow. Even if you did trust the government to have that kind of power, with tons of Iron Man armors it would be so easy for one to fall into the wrong hands. And guess what? Yep! How many episodes in do you think it takes before that happens? Episode freakin' one! So throughout the series the real Iron Man fights various monsters of the week, saving Japan from destruction, and yet the Japanese still turn on him when there's the slightest hint that Iron Man has connections to the bad guys. This really just doesn't see natural either. I mean, after all the good he has done they don't have any hesitation at all. I just don't buy it. So yeah, I was disappointed by the story. If the producers wanted Japan to turn on Tony they could have really made it look like he was doing bad things all throughout the series. One other minor thing I'd like to mention is that in some scenes, Tony's face looks deformed, like it wasn't quite drawn correctly. Okay, so on the positive side, the action is nice and Iron Man looks great. The women here are naturally proportioned, unlike the women in Marvel Anime: X-Men, so that was nice to see. And there was a cool cameo from another Marvel character, but it was a little too coincidental for me. Not the cameo, but how they did it. This character shows up just as Tony is about to be killed and saves him. All the other times Tony almost dies he is able to get out of it himself, but this one time when there's nothing he can do and BAM another good guy enters to help out, not because he was keeping an eye on Tony but just because he happened to be in the area. This set consists of two discs, and each disc contains six episodes and two extra features. 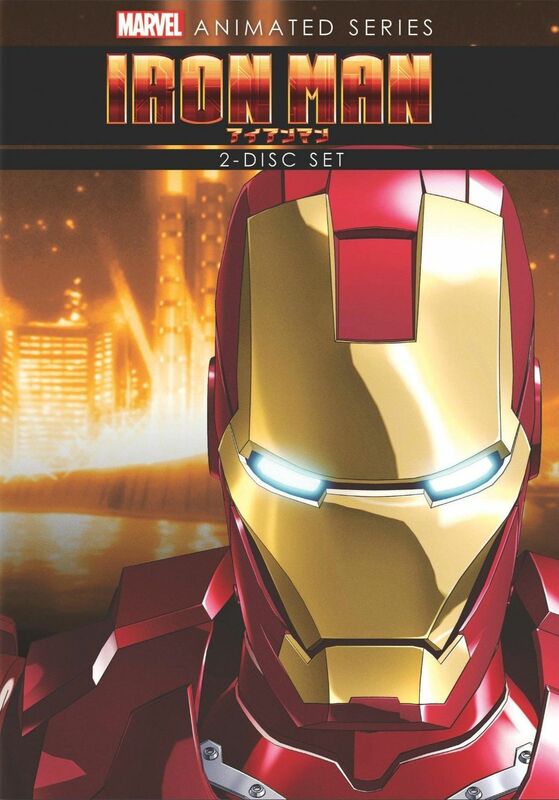 For the extra features, the first disc has The Marvel Anime Universe: Re-Imagining Iron Man and Voicing Tony Stark: Interview with Keiji Fujiwara, and the second disc contains 21st Century Hero: The Technology of Iron Man and Special Cross Talk: Marvel Anime's Iron Man and Wolverine. All are informative and worth checking out.